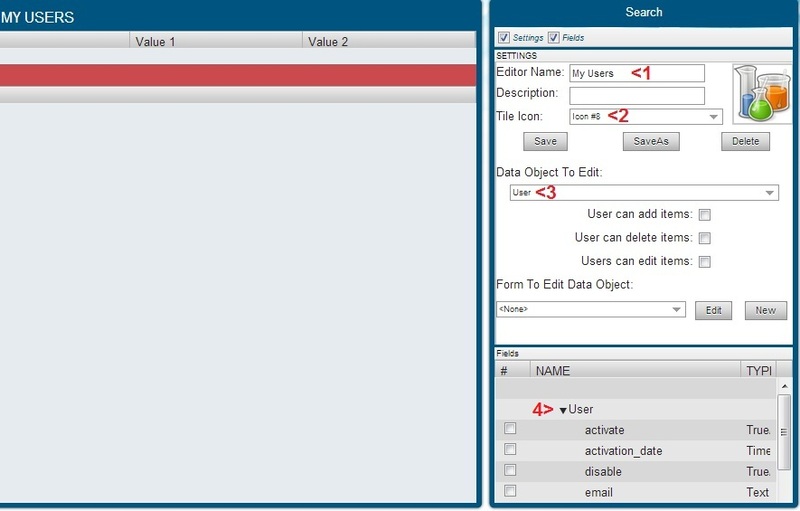 This page shows how to add a ‘Data Editor’ so that users can search and modify data saved as part of processes. Navigate to your home page, and click the ‘Edit A Data Editor’ icon. If this icon is not on your home page, you can add it using ‘Settings’ on the top right of your home page. Click it to open ‘Edit Window’. Under the option ‘Edit Data Objects’ select ‘Add Or Edit Data Editors’ – for more details see Step.1 of ‘Creating a process in 12 Steps’. 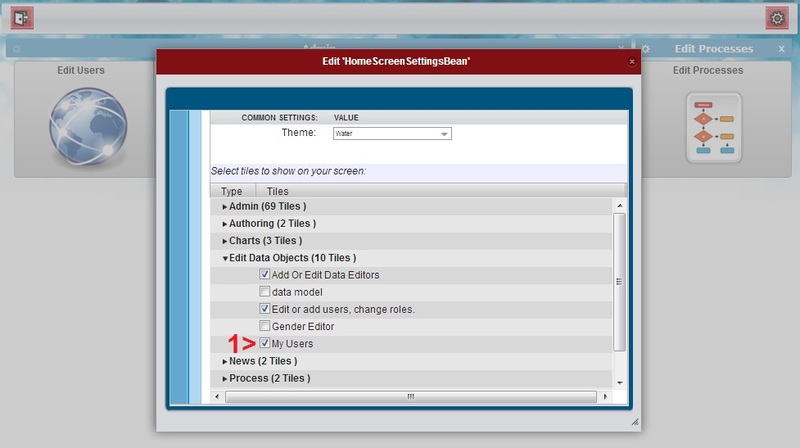 From ‘All Data Editors’, click on ‘Create Data Editor’ (1) to open the ‘Data Editor Designer’. Give a name (1) and select an icon (2) for the data editor. Select the Data Object (3) that this editor will edit. This will allow the ‘Fields’ table to populate with the fields of the data object (4). Select the fields that will appear in search results (1) – the column with the field’s name will appear (2) in the search area. Click on ‘Search’ (3) so then any data values present will be shown in the search result area. To Search a ‘Data Object’ first ‘Add’ a search term by clicking [+] (1). Select the field name for comparison (2). Provide values to be compared with the field (3). Now click ‘Search’ (4). This will fetch the results to be displayed (5). Enter the ‘Data Editor’ name (1) and click Save (2). The tile will be added to your home page (1). If not then please re-login for it to appear.